Wilbers Install... A Shocking Tale! Re: Wilbers Install... A Shocking Tale! I just found your post and read the entire thread. Very helpful! I am in the same situation -- 2007 K1200R Sport. 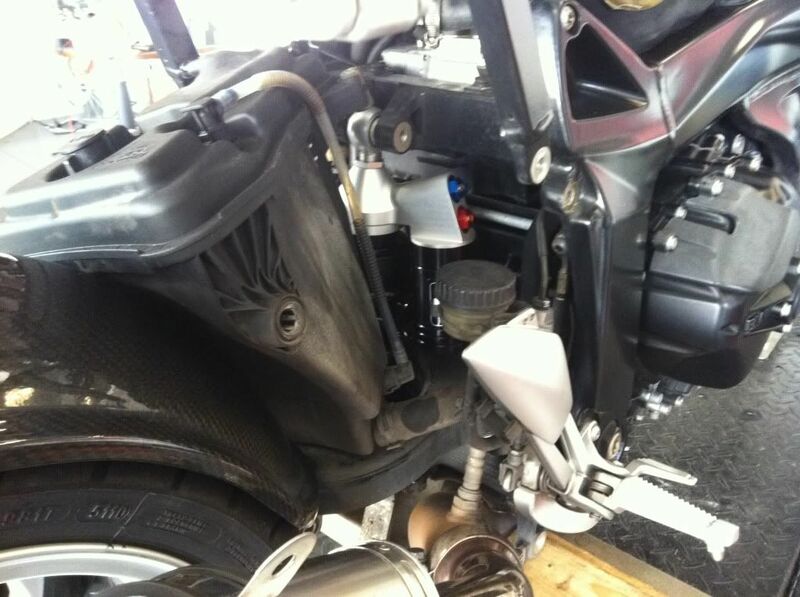 Want to install Wilbers -- 630 front, 642 rear with remote preload adjuster, like you did. Can you please answer a few more questions? 1. 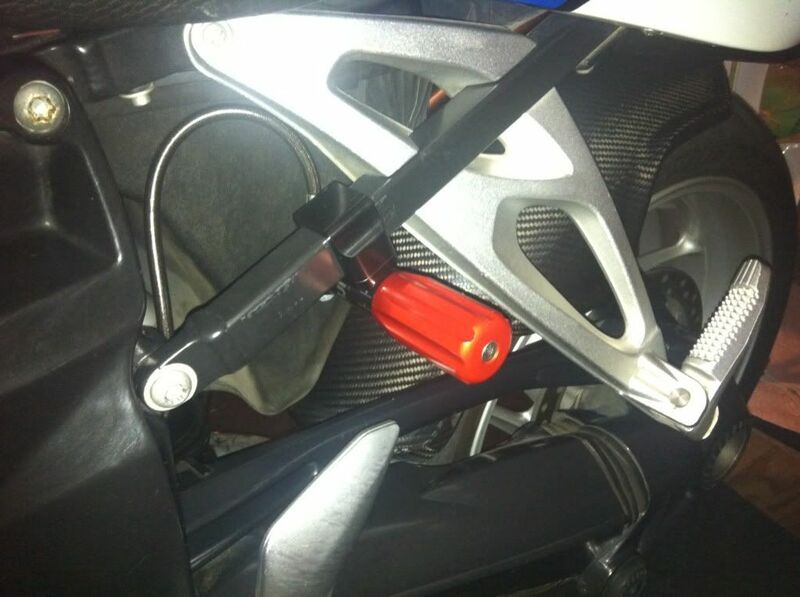 If you still have the bike, can you please post a few detailed pictures of the rear shock, showing the position and access to the damping adjuster screws? Where exactly are they, and can you get to them easily for adjustment? 2. Are you still using the same mounting bracket for the preload adjuster that you manufactured? Has it been working well, or would you do it differently? 3. When you removed the ESA shock, did you have to do anything with the onboard electronics, or ESA control switch on the handlebars? 4. Any other advice or tips on ordering or using the Wilbers? Specs, color, installation, setting...? Still happy with them? I'm not Curt but I have some pictures. I found that I could get to the adjusters but I had no feel for how many clicks I was making. It's not easy but it can be done. I didn't like the clamp. As you can see, while I was trying to position the preload adjuster I did some minor cosmetic damage to the frame. So I just went ahead and fixed it the way I liked!! For question #3, there was nothing to do with the ESA. No problems. And, if you are looking for a really good deal on used Wilbers, let me know. I have moved on and have these sitting in a box at home. They have 15k miles on them and are sprung for my weight and riding style so you should have them rebuilt for you, but there it is! I followed this Wilbers install on my K12, it was a bit of a hassle getting the right spring rate. After a few free spring changes (Thanks Beemershop!) they worked well. If you are doing this swap think about what you have and how close the springs are to what you need. Don't let Wilbers or the dealer give you the stock answer as it may be way too stiff. I have 30 lbs off the bike and never ride two up so the track/occasional two up spring was bad for me. Also consider Ohlins, they make shocks for our bikes again and I have them on my K13. Truth be told I can not tell the difference once properly adjusted. But since I knew my spring rates from the K12 and insisted on those same rates for the K13 the Ohlins were a breeze to install and adjust. Even the sag came out identical. I had Wheels and Wings do the work and set my suspension. There was a lot of back and forth communications to get it right the first time. Herman was awesome to work with and I'd highly recommend him. Now, I was lucky because I could drive over and have it all set right then. If I had to deal with cross shipping or if I wasn't honest about my riding style, weight, etc then it would not have been as good of a transaction. And the Wilbers were awesome. Joe & all, thank you for replying to my questions and posting the pictures -- very helpful. It does look like the mounting bracket supplied by Wilbers has the preload remote adjuster sticking out to the side, so I think I'll do something similar to what Curt did -- make my own bracket. Don't want to drill the frame. Also, from Joe's picture, I gather that compression damping adjuster screws are accessible on the right side, probably with a short stubby screwdriver. Right? And the last question: the rebound damping on both shocks is adjusted by the collar at the bottom of the shock (red, notched in Joe's photo)? Correct. High speed compression is red, low speed is blue. Also correct, rebound is the knurled knob on the bottom of the shock. Blissed, I could not tell from your signature or profile what bike you own, somehow I missed it. But if you are talking K13S or K12S (or even GS) The bracket that Ted Porter supplies for the Wilbers rear shock reservoir Knob is to be sandwiched between the lower rear sub frame strut and the frame where it bolts. It is a good fit and requires no mods. And Ted says (I have done it on a GS) that you can rotate the hydraulic hose to fitting connection a few degrees to get perfection as needed. Upside down, but if you look between the black attachment of the rear frame and the main frame tab you can see a sliver of silver, that is the aluminum bracket for the adjustment device which is held to the bracket by two allen bolts one of which you can see the head of. Ted will also set you up without the preload adjuster for those who do not ride two up or carry heavy baggage. On the order, I specified rider weight (incl. all gear) 190 lbs, ridden 50% solo and 50% with luggage. Ted added "ALSO RIDDEN BY 160 LB RIDER, DO NOT OVER-SPRING!" In your experience, are they too stiff? Why is front 115 vs 100 in rear? My bike is stock, with no mods. What spring rates did you get for your bike & weight? I am 180 lbs summer ready to ride, 185 winter. Solo rider, no luggage. The bike is down about 30 lbs, Lithium battery, removed ESA and no hydraulic adjustment on the Wilbers are the big weight savers. Front 115, I should change it down one, I get my wrists hammered if I am on the Botts Dots too long or take Tunitas Creek road. Rear was 100, went down to 90 to get sag and wheel control where I wanted. This was not only a ride decision, the rear wheel was not tracking well on rough roads. 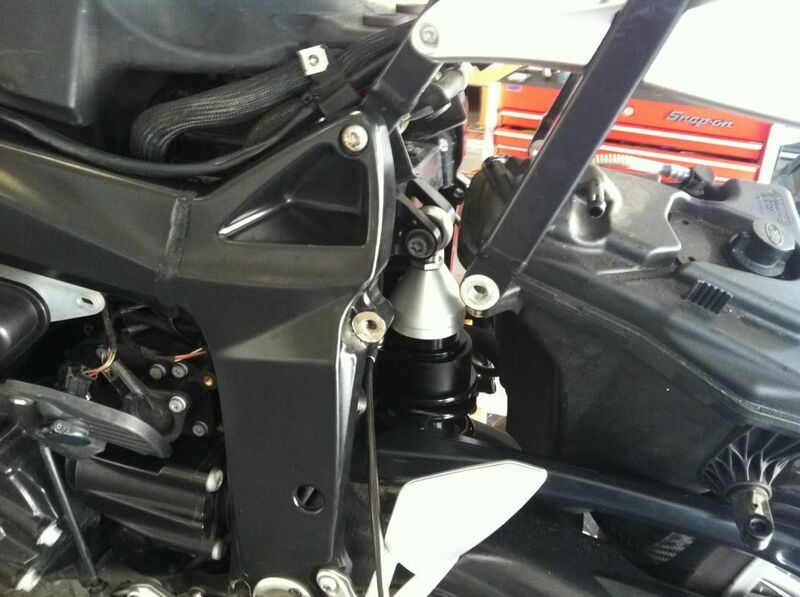 Springs front and rear on motorcycles are seldom the same. The front has to absorb wheelies and other large inputs more than the rear. There is more weight on the front wheel. The leverage on the arms holding the wheel is different. Thanks for the info, DOA. If I understand you correctly, you have 115 front (and considering less) and 90 rear (changed from 100). Is that on K1200S? I have 2007 K1200R Sport, with probably ~10 lbs of added accessories without any luggage, so that would make my bike about 542 lbs. With 190 lbs rider it's 732 lbs total. If you have K1200S minus 30 lbs, that would make your bike about 517 lbs. With 180 lbs rider it's 697 lbs total. So that's 35 lbs difference between you and me on our bikes. Given that I sometime carry additional ~30-40 lbs of luggage when going on multi-day trips, I'd hope that my springs are not too stiff. 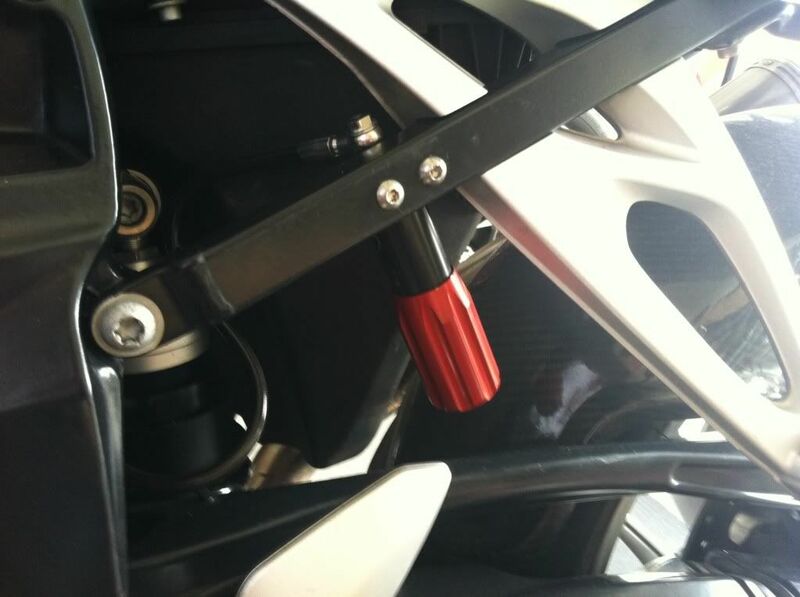 The rear shock has a remote preload adjuster. I guess at this point I should just get the shocks installed and see how they work out. Yes, I have the Wilbers on my K1200s, I forgot to list full Ti exhaust. Sounds like you have the right springs, just get the sag right and start dialing in the dampening. My Wilbers dialed in just under mid range on the dampening. Factory was 3/4 to full dampening and too harsh for the roads here. One click is not really noticeable, go 4-5 each try until you know you went too far. bumping this thread because, well, it is good! 1/ on a K13s, the ESA connectors are different. no blue plug. there is a black and a white plug in the location of the k12 blue plug. what a major pita to get those connectors apart. bmw put the catch release on the inside of the plug where you cant reach it. 2/ some prior owner/mechanic duffus cross threaded the bolts that hold the back of the oil tank up into the rear frame nutserts. that cost me a half hour of time in the reassembly process. noticed that when installed, the high/low compression adjustment screws end up behind a chunk of the frame. what tool do folks use to adjust them? really short screw drivers? i am 200lbs with gear. i got 115/95 springs from beemershop. doing the front shock tomorrow. Was it the right side frame rail that was cross threaded? I did mine three weeks ago and it tried to start crooked and took a fair effort to make it go straight for some reason. I picked up on it about a third of a turn in on the start. Just did not feel right and with the upside down 20 degree slop it is hard to get a good prospective on it. The front in it's own way is easier. I agree the adjustments are difficult to get to. left side. nutsert in frame was really messed up. i got the thread on the bolts cleaned up with some thread straightening dies, but no go on the nutsert. i am sure i just munged it up more when i ended up forcing the bolt back in. argh. Thanks for the flex driver idea. Quick question as I reassemble the front. The bolts for the shock. Upper and lower are different lengths. Manual says shorter one on bottom. Pretty sure when I took it apart, the short one was on top of shock. Which is which? Ok, I am impressed with teds beemershop. The sag after installation was exactly correct. No adjustment needed. Now I just have to put all the Tupperware back on. A favor to ask. I need the over all length of a rear K13s shock, equal to center line of the mount bores. I just got my Wilbers back from Ted's shop for a rebuild and I never thought to measure this. The rebuilt shocks are in the bike and the rear shock has the bike up in the air about 1-1/4" higher than stock. Like it has lift plates. It is on minimum preload. Sent an email to them today but I'm going to have to pull the shock and send it to them for a re configuration. Interesting part was when it was new from Germany it was a perfect replacement in the length department. There is also no way to set the sag to what it should be in the current condition either. 13.25in on the stock shock I just pulled off. Thank you, out to the shop to do some measuring. While we are at the measurements, what exactly is the amount of travel on the Wilbers rear shock (type 642 Competition)? Is it the same as the factory ESA shock -- 135 mm? This is complicated. The two shocks are different. 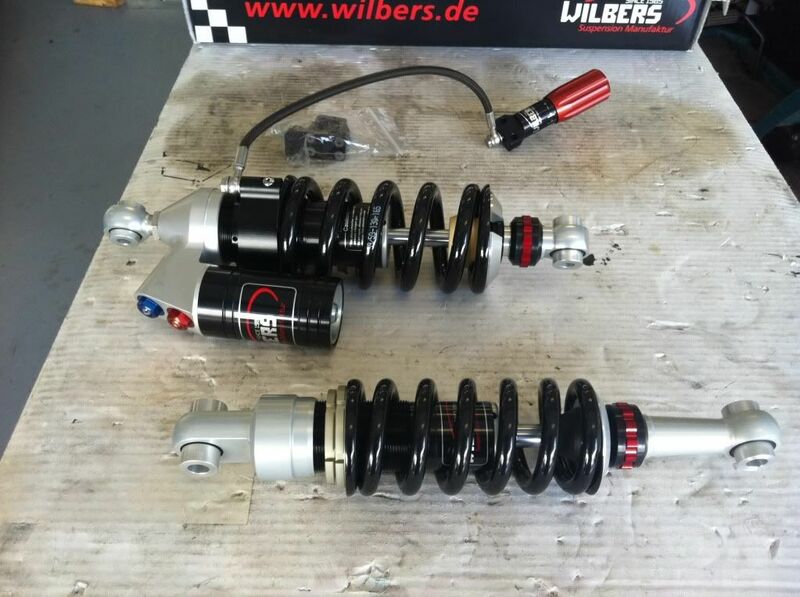 OEM electronic is a touring shock and the Wilbers is a performance shock. Yes, about the same travel. The Factory rear shock is 332 mm long. The wilbers is 336 mm long. This raises the rear for a bit more steering. All the shock companies do this so you think things are better. If you want a comfy shock you will have to really stress this with the vendor. In my case I got the stock shock for my weight and bike. It came with the external preload adjuster all the way to zero/out all the way. I sent it out for a rebuild and it came back as purchased. The internal preset preload set for my "weight" and "use". Not for me. I can't even dial in sag because the preload is already at zero. I can't back it off and build in some sag. You need about 30/40 mm sag, 10 or so just when you take the bike off the center stand. 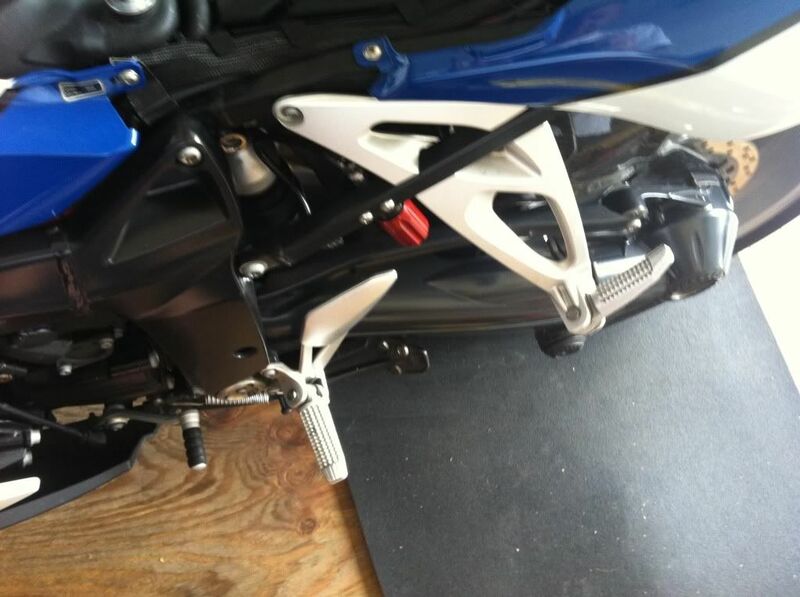 I am at 15mm sitting on the bike vs. bike on the center stand. Not good at all. Next rebuild I will specify I want the internal preload reset so that the external is about 1/3 applied, not sitting at zero applied. I want some adjustment. I can say with my riding gear on and the bike loaded for a trip it all works well. But I'm still at zero preload on the external adjuster. I should need to dial it up some for a load. That does not cover it for local riding. I could adjust it with the remote preload adjuster for all the gear if the internal adjuster was not set so hard. Not that happy but not willing to spend a day removing and installing and then paying shipping and then more money to "them" to set it to my liking. It will happen next rebuild. This is the rear shock. Send your stock OEM electronic shock to EMP in New Jersey for rebuild and you will be all set. I'm really not happy as I stand right now. And I don't believe the shock is the same as when I bought it new, contrary to the rebuild specs. It does not feel the same even though it is mechanically to the same spec. Send your stock OEM electronic shock to EMP in New Jersey for rebuild and you will be all set. Great suggestion, will call them. Thanks! curious what you mean by "internal preload". as i understand shocks, the only stuff that is internal is the damping for compression(maybe, this can be external) and rebound. preload deals with the spring...which is external to the damper. preload is only adjusted by compressing the spring, or "preloading" it more than just the weight of the bike and rider would compress it. the external adjustment knob just controls the adjustable spring perch on the outside of the damper. am i missing something? it the adjuster somehow not releasing correctly? maybe you mean the preset starting point for the adjuster? post a pic of the top of your rear shock...about the same amount of threads visible as in justjoe's pic above? sounds like what you may have is either a spring that is too long, or a spring that is too stiff. That does not sound right if the shock is built and set for you weight it should be at set at that at the factory and the preload should be set in the middle of the range. Thats how mine came out of the box preowned but unused.